Welcome to Part Three of denkbots’ meta-analysis on combat robots: Comprehensive Analysis of ComBot Fights! We will be building upon our analysis in Part One: Introduction to Robot Archetypes and Part Two: Analysis of Championship Fights so take a moment to review if needed. The following analysis was done on data collected from BotRank and supplemented with robot classifications constructed from TheBuildersDataBase, BattleBots Wiki, Robot Wars Wiki, and general data collection. For this analysis each robot was categorized by archetype, then all match data was paired with the corresponding winning and losing robot’s archetype. 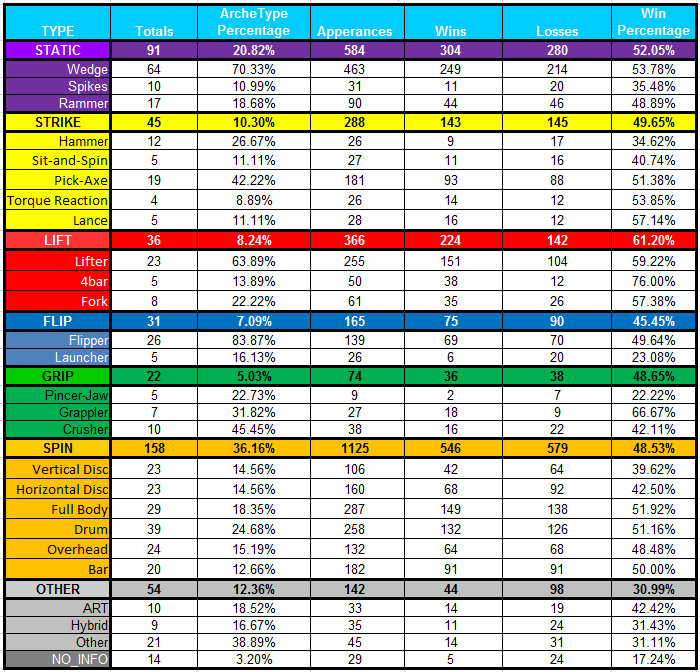 From the constructed data table, each archetype’s Field Percentage and Win Rate could be calculated. Below is an overview of the results for all collected match data which is comprised of 60 Events, 1372 Matches, and 437 Bots. To add more resolution to the data set above, each robot was also assigned a sub-type. 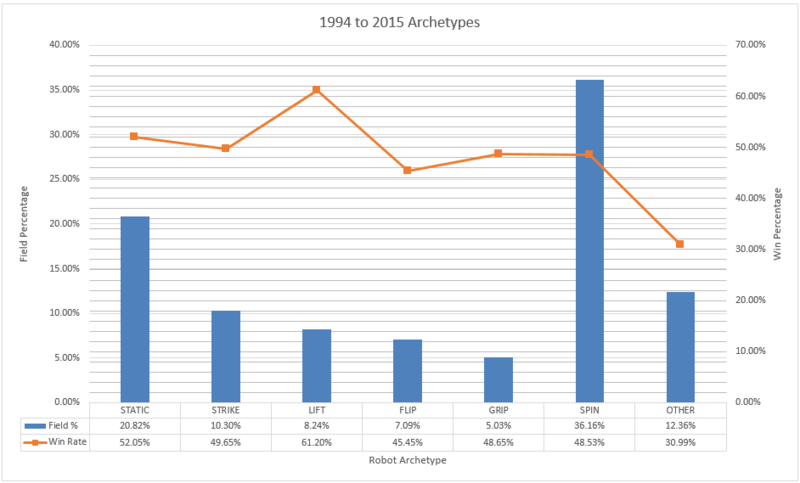 Expanding upon the analysis done above, the representation of a given sub-type within each archetype (“Archetype Percentage”) and the win rate (“Win Percentage”) was calculated. Below is a summary of the results for all collected match data. Finally, by analyzing the archetype match-up from the data table and calculating the wins of each archetype over the other a meta-analysis of the archetypes was conducted. In the table below the archetype presented in the top row is the winner against the archetype in the corresponding column. Below is a summary of the meta-analysis for all collected match data. To clarify the data above the table below provides the win rate for each archetype match-up, highlights win rates above 60% in green, and highlights win rates below 40% in red. While there are many takeaways waiting to be expanded upon in the data above, we will save that discussion for a later article. Feel free to share your thoughts on the data above by commenting below! Moving forward, we will expand upon the tools employed above in the next section by performing individual analysis on historical sub-sections of the data.